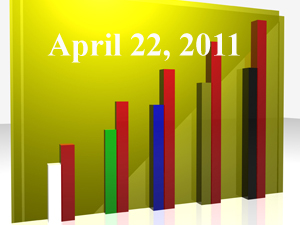 “What 401k Plan Sponsors Might Expect from Proposed Fiduciary Rules” (Fiduciary News, April 19, 2011). It might surprise you to discover the industry’s loudest complaints against the fiduciary standard might also be the strongest arguments for the fiduciary standard. We look at the three biggest issues and how they might really affect 401k plan sponsors. Are ETFs a ticking time bomb or the Holy Grail of investing? It may take a generation to find the true answer and, by then, it’ll be too late for most of today’s retirement investors to have done anything about it. And what’s a discussion about ETFs without revisiting the age-old passive vs. active debate? “How ETFs Have Reshaped Investing,” (Wall Street Journal, April 18, 2011) It’s more than making it easier for investors to create model portfolios based on asset index funds. Don Phillips says it also appeals to our sense of gambling, which is a bad thing. He says, while regs have prevented a repeat of the tech-heavy mutual funds we saw just before the bubble crashed in 2000, ETFs are more exotic and exist in a wild-west type environment. In addition, ETFs may also impact the manner in which the underlying securities are traded. Is this good or bad for the market? “Why ETFs Lag Their Indexes,” (Wall Street Journal, April, 18, 2011) This goes well beyond tracking error. It turns out ETFs – particularly those investing in foreign country stocks – act more like closed end funds rather than open end funds. Investors can get stuck paying a premium (or a discount). “Bond ETFs Offer Investors an Increasing Number of Choices,” (Wall Street Journal, April, 18, 2011) The good news: It’s easier to mimic the maturity date of a bond with and ETF as opposed to a mutual fund. The bad news: It’s still an ETF and can carry the inherent liquidity risk. “Actively Managed ETFs Haven’t Gained Much Traction Yet,” (Wall Street Journal, April, 18, 2011) Here’s proof it’s all about index investing, not about ETFs. Well, as we said above, it’s really about sales and marketing. Face it, there’s a huge marketing effort behind index funds. There’s nothing similar promoting actively managed funds. Alas, poor fiduciary standard! We knew it, dearest readers: A concept of infinite ease, of most excellent sincerity: it hath borne us on its back a thousand times; and now, how abhorred by the industry it is! Regulators rim at it. They have hung their lips and kissed the idea off. Where be their ideals now? Their standards? their ethics? their conflicts-of-interest, that were wont to set the table on a roar? Not here now, they mock with their own grinning? quite down-fallen? Now get they to their lobbyist’s chamber, and tell her, let her paint an inch thick, to this 12b-1 she must come; make her laugh at that. “Writing a new fiduciary formula: Creating a retirement education policy statement will help employers fulfill their fiduciary obligations,” (Employee Benefit News, April 19, 2011) A recent survey shows 401k investors don’t know the difference between investment advice and investment education. Why is this important? Because the 2006 Pension Protection Act and the DOL’s new fiduciary rule means 401k plan sponsors and fiduciaries are on the hook. The article doesn’t say it, but education might represent the next evolution in the 401k/403b advice market. “Time to update ERISA fiduciary rule,” (Pensions & Investments, April 18, 2011) Phyllis C. Borzi, assistant secretary of labor for the Employee Benefits Security Administration, pens this opinion piece. Spoiler alert: Fiduciary fans salivating over this one might be disappointed to read Borzi believes it’s still OK for the DOL to provide exemptions for certain prohibited transactions. That sound you hear is the semi roaring through Borzi exemption hole. “Administration big: Single fiduciary standard needed,” (Investment News, April 19, 2011) Warning: If you’re a fan of the fiduciary standard don’t read this article. Although it looks like it might be good news, it’s really exposing the ineptitude of the administration. Ironically, disclosing the SEC is independent from the administration and therefore off limits in terms of partisan politics, he nonetheless goes ahead and makes a blatantly partisan statement. The SEC is already dealing with partisan strain within its own ranks. It doesn’t help that the administration is stoking the fire in Congress. “Glenn Beck reveals fiduciary standard dilemma,” (BenefitsPro, April 20, 2011) How do we know when Glenn Beck crosses the line between reporting a news story on gold and selling gold? Some, including, apparently from the above, Phyllis Borzi, advocate we can resolve this with disclosure, but academic studies show disclosure doesn’t work. It’s become increasing hard to imagine any “compromise” would meet the objective of the fiduciary standard. Perhaps the time has come for the end of dual registration. Chicago Financial Planner: Are Target Date Funds On Target for You?